Most of our students won’t go on to study psychology after their A – Level course but one of the things we can teach them that will help them whatever they do next is to read effectively. In the past it has surprised me how a student might be able to read a complex text very fluently, yet have very poor comprehension and retention of what they have just read. One way of increasing the effectiveness of students’ reading is to use the reciprocal teaching technique originally developed by Palincsar and Brown (1984). All group members silently read a section of the text. While they are reading, the ‘teacher’ must think of a question about that section of the text. Once all have finished reading, the ‘teacher’ asks their question of the group. The group then discusses and agrees on an answer with the ‘teacher’. When the ‘teacher’ is satisfied with the answer, they summarise that section of the text. A new ‘teacher’ is chosen and the cycle begins again. The power of reciprocal teaching comes when you establish as a routine in your classroom, and practice is important. What is crucial is the quality of the questions the ‘teacher’ asks. They have to be genuine questions that require deep thinking, rather than ones that can be answered simply by pulling a word or phrase out of the text. For this reason it is helpful to model the process of thinking up a question and discussing it with the class before handing over to the students. I also find it useful to circulate and monitor the quality of the questions, intervening where necessary. With regular use, reciprocal teaching becomes just ‘our way of reading’. Reciprocal teaching has been extensively tested and is associated with substantial learning gains. Hattie (2008) reports an effect size of 0.74. Much of this research has focused on younger learners, many of these with poor reading relative to age, so it is sometimes overlooked that it also has a positive effect on apparently proficient learners of high school age (Alfassi, 2004). One problem I have encountered, however, is finding suitable texts for my students to use with the technique. 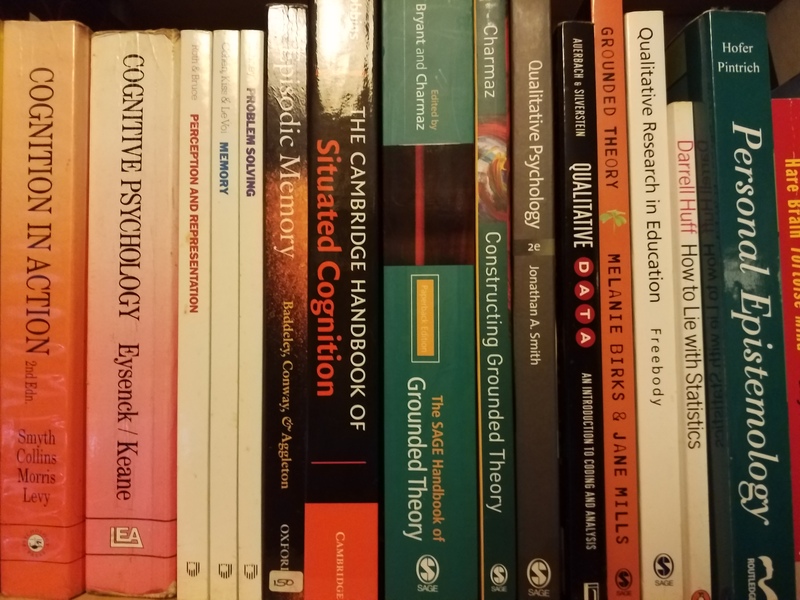 Research papers and more advanced undergraduate textbooks are potentially too difficult for students to access, especially if they are new to psychology. However, the typical A – Level textbook is laden with intrusive ‘pedagogical features’ that deprive the students of opportunities to ask each other good questions and generally ‘grapple with the text’ in productive ways. Consequently I have ended up preparing a number of my own. These are written to be ‘just difficult enough’ but kept short enough for students to process them in a lesson phase lasting 15 – 20 minutes or so. I’ll be tagging these as ‘reading’ when I post them up. Alfassi, M. (2004). Reading to learn: Effects of combined strategy instruction on high school students. Journal of Educational Research, 97 (4), 171-185. Hattie, J. (2008). Visible learning: A synthesis of over 800 meta-analyses relating to achievement. London: Routledge. Palincsar, A.S. & Brown, A.L. (1984). Reciprocal teaching of comprehension-fostering and comprehension-monitoring activities. Cognition and Instruction, 1 (2), 117-175. Here are some resources for teaching introductory memory concepts. There is a memory concepts slideshow, some wordlists for serial position demonstrations, a spreadsheet for graphing the serial position demos and a short reading on Milner et al’s (1968) ‘HM’ case study. Two very powerful techniques for provoking learning are getting students to make comparisons and using graphic organisers (see Marzano et al, 2001 pp. 14-20). The process of making comparisons helps with the acquisition and refinement of concepts because it stimulates students to think and rethink the boundary between this and not-this. It also requires some fairly deep processing of the sort that seems likely to support long term retention of ideas. The use of graphic organisers helps to facilitate understanding by making it easier for learners to discern the relationships between ideas. There is consequently strong justification for using comparison tables a lot, and I do. A standard comparison table with predefined criteria. Typically, I use a table organised around criteria given by me. This works well enough but it’s also somewhat unsatisfying precisely because I give the criteria. Marzano suggests this is preferable where convergent thinking is required because the students are unlikely to come up with suitable criteria on their own. Point taken, but all the same, what we’re presumably shooting for here is students who are capable of defining their own comparison criteria. I have been developing a visible thinking routine (see Ritchhart et al, 2011) that shows some promise in this direction. In groups of three or four, students start by generating as many facts as they can about each of the things they are comparing. Each fact is written in a separate sticky note. Once students have identified some comparisons they can be encouraged to add more facts to match up with any ‘stray’ sticky notes that don’t currently have a corresponding fact about the comparand. The students have by this point constructed a skeleton comparison table. The next step is to encourage and support them in distilling and naming their comparison criteria so they can make their comparisons explicit. Depending on the students they might need more or less scaffolding to do this. The comparison VTR in progress. Students have started identifying correspondences. Translating their table into well-formed written comparisons (stems can be helpful here). This process has two significant virtues in that (1) the students do more of the thinking since they go all or at least some of the way to working out their own comparison criteria and (2) it makes their thinking processes visible to you – so you can intervene helpfully – and them, which supports metacognition. I’ve used this approach several times and am satisfied that it results in comparisons that are as good as those that emerge from a pre-prepared table (although it does take a bit longer). I am unable to say whether it has any significant impact on my students’ more general capacity to think in comparative ways, although it has intuitive appeal. The important point here is that a visible thinking routine needs to become, well, a routine. I have not yet used this approach consistently enough across a sufficient range of contexts for my students to incorporate into their everyday thinking repertoire and thereby to permit spontaneous use and generalisation. My next step, therefore, is to review my schemes of learning for next year and see where the opportunities for this might be. Marzano, R.J., Pickering, D.J. & Pollock, J.E. (2001). Classroom instruction that works: Research based strategies for increasing student achievement. Alexandria, VA: ASCD. Ritchhart, R., Church, M. & Morrison, K. (2011). Making thinking visible: How to promote engagement, understanding and independence for all learners. Hoboken, NJ: Jossey-Bass. A timeline of concepts/theories/observations/applications/innovations in psychology. We recently moved to a linear/terminal assesment curriculum with a heavy synoptic element (Edexcel A – Level; other brands are available). As we experimented with different ways of teaching the synoptic elements it repeatedly struck me how much the last seventeen years of modularisation have militated against the kinds of ‘joined up’ thinking that is characteristic of good quality learning in Psychology (and, presumably, other subjects/disciplines). One manifestation of this is that many of our students lack a coherent sense of how the curriculum fits together chronologically. I initially wanted to address this so our students were prepared for questions about ‘how psychological understanding has developed over time’ (Edexcel 2015 specification) but as soon as the students got stuck in it became clear that the activity that emerged could potentially provoke a much deeper understanding of psychological ideas in context and the relationships between them. In the first phase of the lesson I simply invited the students to populate the timeline with as many concepts/theories/studies/applications/observations as they could. For this, they worked in small groups, one to a topic. I encouraged them to work from recall as far as possible but to supplement their memory with material from their notes and to look up additional things they decided were important. 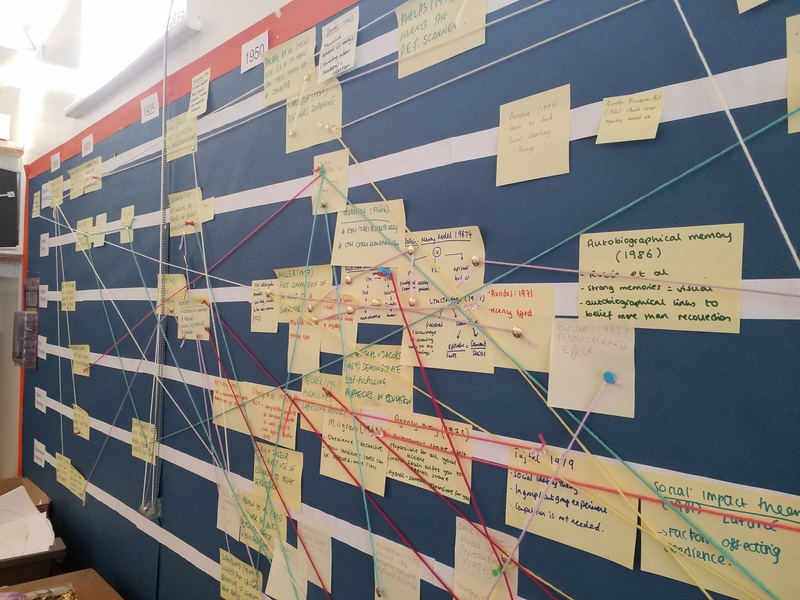 In the second phase, once the timeline had a decent amount of material on it, each group was given a ball of wool, a different colour for each topic. They were then invited to start connecting the concepts/theories/studies/applications/observations to show how earlier ideas influenced later ones. Can you see any patterns? From this discussion the whole group then distilled some important influences on the development of psychological knowledge and understanding (e.g. the use of the scientific method, refinements in methodology, the interplay between ‘pure’ and ‘applied’ areas, new technologies, and social change). 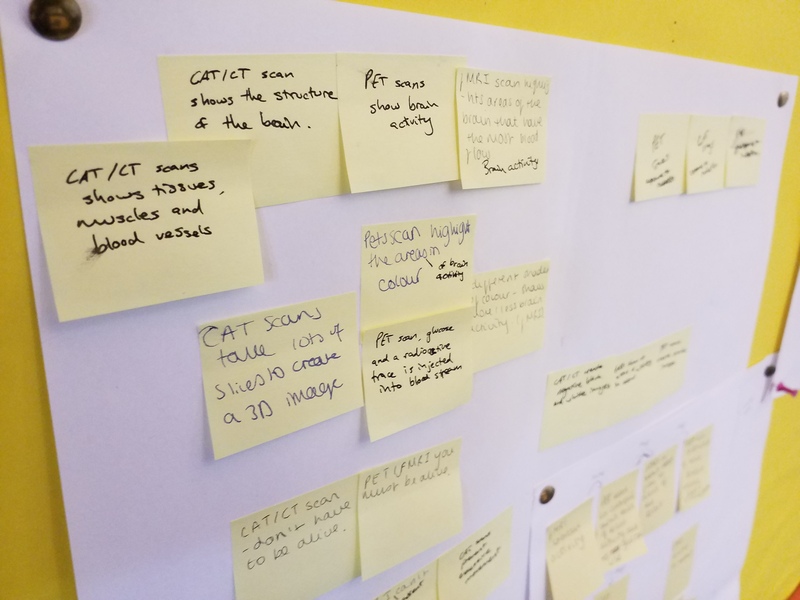 In the following lesson the students developed their writing by selecting a few ‘strands’ from the timeline and using them as the basis for an essay. I believe that this provided an opportunity for students to integrate the things they already knew into a more coherent and stable conceptual structure. The students reported that it was engaging and thought provoking. Time (and the examiner, of course) will be the judge of whether it really did have the intended effect. But I was sufficiently impressed to regret not having thought of this before. My intention for the coming academic year is to start the timeline very early on and add to it gradually over the year. My hope is that I can thereby build that ‘joined up’ thinking right through the course. psychlotron.org.uk has re-entered the building. The original psychlotron.org.uk psychology resource website started in 2005 and was regularly updated until 2013. At that point, fatigue, exam specification changes, cancer (my partner’s) and then open heart surgery (mine) collectively intervened to bring further updates to a halt. As I now have material I’d like to share and a bit more time and motivation I’ve decided to pick up where I left off in 2013. If you used the site before you’ll notice I’ve ditched the lovingly hand-crafted html of yore and will now be building psychlotron using WordPress. I’m hoping that this will make managing the content a bit more straightforward and the addition of things like tags and a search box will make it easier to find what you’re looking for. If you’re looking for links to resources posted on the old website, try the archive link on the right hand side. I’ve combined all the old resource links on one big fat web page; you’ll have to scroll down until you find what you’re after. New resources will be posted in the new ‘blog’ format and tagged to make them searchable. Here’s an experimental one to see if the process works as intended: an application problem for teaching the multi-store model of memory. Author AidanPosted on 4th June 2017 7th June 2017 Categories ResourcesTags application problem, cognitive psychology, memory, multi-store modelLeave a comment on psychlotron.org.uk has re-entered the building. You can reach the archive here.